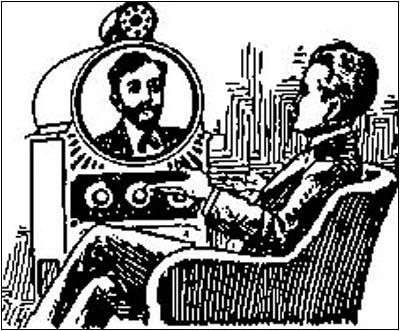 The January 2002 Antique Radio Classified article by Ray Bintliff about the rather puzzling discovery of photographs of an early RCA television set with Cyrillic labeling did not escape my notice and brought back some memories of a discovery of my own. I would like to offer the following account, which may solve this mystery. There, as Figure 2 shows, front and center on the large wooden cabinet, was the unmistakable RCA "meatball" logo. This was indeed a strange thing to find in a museum where virtually everything was labeled and branded in Russian. No one was around to answer my questions about the set's ancestry, so I took my share of photographs and resolved to try to find out how that particular RCA set had wound up with Cyrillic labeling and why it was spending its retirement days in a Moscow museum. I pondered the matter on the long trip back to America and realized that I had seen a similar, if not identical, set somewhere else. Reviewing photographs I had taken at the AWA Electronic Communications Museum in Bloomfield, New York, I located that receiver. Minus the Cyrillic lettering, one control knob, and a few minor cosmetic details, the AWA set was a dead ringer for the Russian museum model. My photograph of the AWA set appears in Figure 3. A placard with both sets indicated that they operated on the 343-line standard. That dated the receivers fairly well, as this was an intermediate standard of sorts that predated the U.S. 441-line standard with which television premiered at the 1939 New York World's Fair. Figure 1. 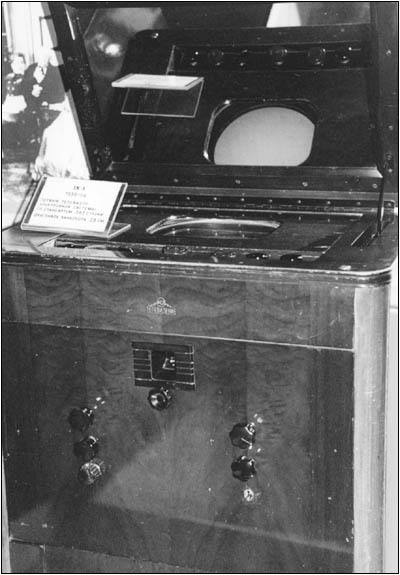 The RCA receiver as it appears in the Moscow museum. A chance conversation some time later with fellow television enthusiast Nat Pendleton revealed that he not only knew the model number of the set, but actually owned one. He was working to restore it both electrically and in appearance. His set is shown in Figures 4 and 5. 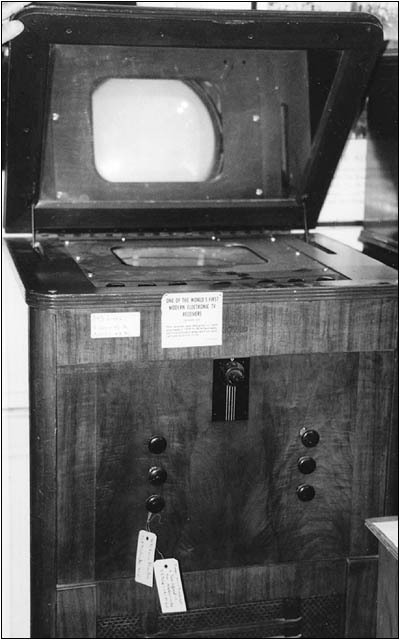 Sometime before the set passed into Pendleton's possession, the original CRT had been removed and replaced with a more modern (shorter), direct-view tube, placed in the horizontal position atop the set. The controls inside the cabinet top compartment had been relocated to the front of the set, and the original top had been discarded in favor of a simple cover over the replacement CRT. 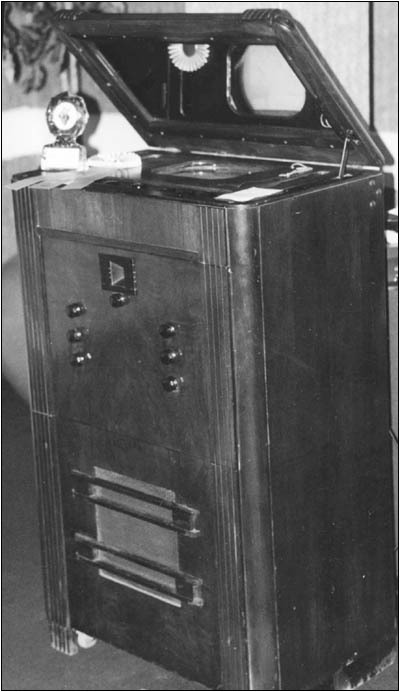 This early RCA model was revealed as the Model RR-359 and sported a 9" picture tube. Pendleton informed me that the set was also made with a 12" tube and that variant was labeled the Model RR-359B. Both receivers would have to be classified as field test models, as there were no attempts to market them, at least in this country. The set was now identified as to its model number and dated fairly closely. However, I still wanted to know how it had gotten to Moscow and had learned to speak Russian. I vaguely recalled reading an article about Russian television in a Society of Motion Picture and Television Engineers (SMPTE) journal years before. It had been penned by an American television engineer who had returned to Moscow after a hiatus of some 30 to 40 years. His article basically dealt with the changes in that city since his first trip there in the 1930s. However, as it had been over 20 years since I last looked at the journal, the article was a bit fuzzy around the edges. There just might have been something in it about his working with the Russians on a television project. My next priority was to dig through my SMPTE publications for that particular issue. Figure 2. A close-up of the Moscow museum's set showing the Cyrillic lettering. I finally located what I sought in the September 1972 number the article by one Waldemar J. Poch. Yes, he had been part of an RCA mission to Moscow in 1937 to install an all-electronic television system. The main thrust of the article was the great change that had taken place since Poch's first 10-month stay in 1937-1938 and the state of the USSR television broadcasting and motion picture industries in 1972. He also mentioned an intermediate trip made in 1959 on behalf of his employer RCA. On reflection, I thought this a bit odd, as the U. S. had broken off diplomatic relations with the onset of the Socialist revolution in 1917-1918, and only re-established them with what was then the USSR in late 1933. I found it hard to believe that such a technology transfer could take place in light of this country's distrust of that communist society. Additional research proved me wrong. An excellent book on the life of Vladimir Zworykin, RCA's legendary television pioneer, was published in 1995. In one chapter, the author, Albert Abramson, traced the path of Zworykin as he returned to his native Russia to give a series of lectures in 1934. Abramson states that during this stay, Zworykin was twice asked about the possibility of RCA's selling a television system to the Russians. On his return to the U. S., Zworykin met with David Sarnoff about the Russians' interest in television equipment. Abramson reports that contacts were made with the Russian embassy, and the Soviets ordered a complete television equipment package. Figure 3. The RCA RR-359 in the AWA museum. However, this television equipment deal resulting from the 1933 thaw between the U. S. and the USSR was given only limited publicity. An investigation of all pertinent issues of RCA's house publication, Broadcast News, turned up several television-related stories, but no mention of the deal with Russia or the sending of its television engineering personnel to Moscow. The New York Times carried a brief report in late 1935 from the Associated Press that RCA had signed agreements with the USSR for some $2 million (U.S.) worth of radio-related equipment to be manufactured in its Camden and Harrison, New Jersey, plants. Abramson reported that a Russian commission journeyed to the U. S. in 1936 to inspect and accept the equipment. They remained until 1937. Efforts to locate Waldemar Poch were in vain. I did learn that a friend of mine had once served on a television standards committee with Poch, known to his associates as "Wally"; however, Poch never talked about any of his Russian experiences. The trail was similarly cold as concerned other RCA engineers who might have been part of that 1937 contingent. One element of Poch's 1972 article was rather intriguing. He described the present Moscow Ostankino television broadcasting center, mentioning that it replaced the original 1937 television complex where he had worked. He added " it was with mixed feelings that I saw one of the vintage 1937 receivers on display in a museum devoted to technical developments. This particular model had cost me many hours of work in the middle 1930s." I have little doubt that this was the same receiver that I encountered in Moscow's Polytechnic Museum. Indeed, these early television receivers are rare, with only a handful still accounted for. It must be assumed that the Russian variant is extremely rare, with possibly the only one in existence residing in that Moscow museum. A Russian television Web site offers additional information on certain aspects of Russian television history. While most of the 1972 Poch translated article is centered on the development and construction of the present day Russian television tower at Ostankino, Poch does state that plans for the first Moscow television broadcast center were made at the end of 1936. A site was selected on Shabolovka Street, as a 150-meter antenna tower was already located there. Poch notes that the first experimental transmissions took place on March 9, 1937 and regular broadcasting commenced on December 31, 1938. These dates tie in well with the other information. Figure 4. Front view of Nat Pendleton's restored RR-359. Figure 5. Rear view of Nat Pendleton's restored RR-359. The keen-eyed observer may note that the placard atop the Russian Model RR-359 calls the set a "TK-1" and dates it as a 1939 model. As the "TK-1" designation is incorrect, it must be assumed that the date was also an approximation. Other details should be noted too. The first is the difference in the channel selector escutcheon appearing in the upper center of the set's front panel. There are two distinctly different types one with a vertical orientation and the other horizontal. The AWA museum's Model RR-539 and the one shown in the first photo of Ray Bintliff's article are equipped with the former. The Russian variant and Pendleton's set have the horizontally oriented window type escutcheons. The difference is indicative of a production change in the set's tuner. The horizontal "window" variant was used with a "continuous" tuner, while the vertical escutcheon covered a "detent" or switch-type tuner. 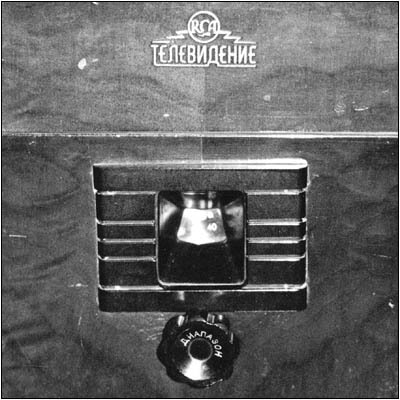 It is speculated that the continuous tuning model was chosen for export to Russia, as television broadcasting channel allocations were probably not the same as in America. According to Pendleton, the switch tuner has eleven channel positions. The word is sometimes used in Russian to indicate tuning. The saga of the Model RR-359 was not quite over even after I had pieced together the above information. I had been following Nat Pendelton's restoration efforts during the intervening years and learned that he would be displaying his set in operating condition at the 2001 Charlotte AWA meet. Figure 5 provides a look at the innards of his restored set. Pendleton had performed a very complete and difficult restoration, and I must admit it was quite a thrill watching television images on such a primitive device! It should be noted that the RR-359's horizontal oscillator had no trouble running at 15,750 Hz for 525-line television instead of the 10,290 Hz mandated by the 343-line standard. The horizontal "speed" control had more than enough "stretch" for this difference. Slope detection of FM audio left a lot to be desired, though. Pendleton was rewarded for his efforts by receiving top prizes by the meet's judges. While Ray Bintliff did very skillfully deduce several things about the Model RR-359 from the photographs, I need to offer a bit of correction on some points. First, the article suggests that the RR-359 was electrostatically deflected. Even though this may appear to be the case from the photograph, Pendleton assures me that the RR-359 uses electro-magnetic deflection. What appears to be the neck of the CRT in the photo is in reality a shield. The yoke, which is a somewhat "long and skinny" affair, is concealed under the shield. There is only one other chassis associated with the Model RR-539. This is a large and heavy affair located at the bottom of the cabinet. It provides both low and high voltages via the interconnecting cable seen in both Bintliff's chassis photo and in Figure 5. The set's tuner, IF, deflection, video/audio detection and output stages are all contained on the main chassis. As was typical of television receivers of this era, there was no RF stage. Bintliff speculated on the unusual mounting of some of the set's tubes. 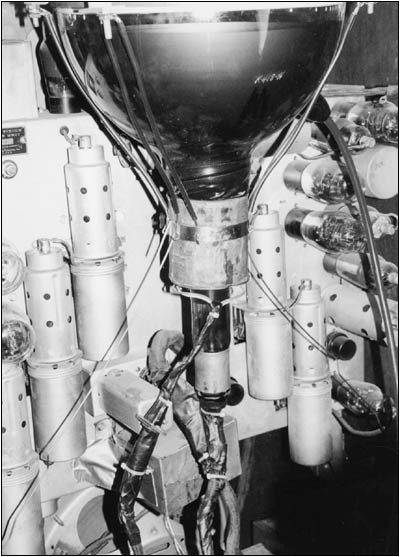 RCA had mounted a portion of the tube sockets at right angles to the plane of the chassis. This effort was not to save space or otherwise to make the chassis more compact, as the RR-359 cabinet is quite large. It was, however, an effort to reduce capacitance effects associated with the tubes' grid circuitry. These are grid cap tubes, and while shunt capacitance to ground didn't matter much with radio applications, the engineers apparently were doing everything they could to get decent high frequency response with the materials available in television's "cave man" days. I would like to acknowledge Mr. Pendleton's kind assistance in providing information for this article and also Elliot Sivowitch of the Smithsonian for assisting me in my research efforts. Abramson, Albert. Zworykin, Pioneer of Television. Urbana and Chicago: U.of Illinois Press, 1995. Poch, W.J. "Moscow Impressions." Jour SMPTE, Vol. 69, May, 1960, pp. 348-350. Poch, W.J. "Notes From a Visit to the USSR in 1972." Jour SMPTE, Vol. 81, Sept. 1972, pp. 691-693. "$2,000,000 Soviet Order to RCA." New York Times , 16 December 1935, p. 40. © James O'Neal, all rights reserved. James O'Neal has been a collector of radio and television sets since his grade school days. Employed in radio and television broadcasting for 40 years, he does television facility design and systems integration for Worldnet Television (the video counterpart of the Voice of America). The views expressed in this article are his own. Copyright © 1996-2002 by John V. Terrey - For personal use only. Last revised: August 2, 2002.